Two suicide bombings at a shopping mall in eastern Baghdad left up to 40 people dead and more than 60 injured, police and medics reported. Islamic State has claimed responsibility for the attacks. Videos from the scene show chaos and destruction. The terrorist act took place at the Nakheel Mall, across the road from the oil ministry, police and medical sources told Reuters. One device exploded at the front door and another in the parking lot. 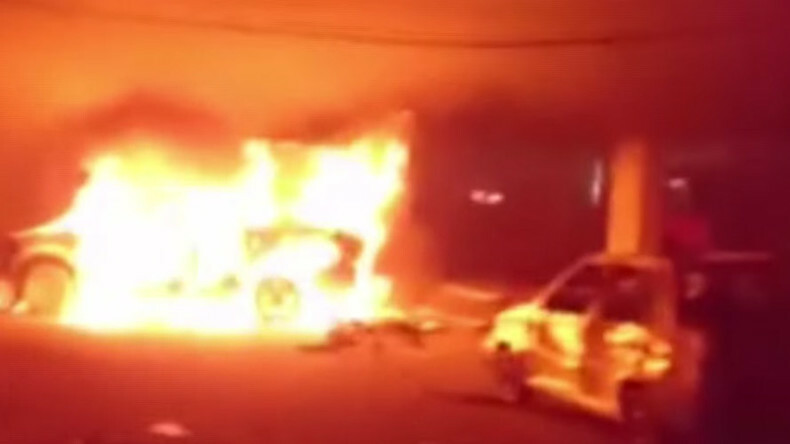 A video posted on Facebook shows several cars on fire. There appeared to be four separate fires raging under the highway overpass next to the mall. The death toll had initially risen to 12 people, according to Reuters. Others media outlets, including AFP, had reported earlier that 11 people were killed, including three Iraqi police officers. But later figures obtained by news agency DPA raised the toll to 40 dead and 60 injured. A parked car is believed to be the source of Friday’s first blast, while the second explosion is thought to be the result of a suicide bomber driving a vehicle, the agency reports. الى متى يا بغداد اعيادچ حزن وألم ؟؟! According to the Amaq news agency, which is run by Islamic State (IS, formerly ISIS/ISIL), the attack targeted “a gathering of Shia” just outside the mall. The latest atrocity comes just as the Iraqi military is preparing to mount an offensive on the IS-held city of Mosul. The terrorist group has controlled a third of Iraq since it proliferated in 2014, but it has been steadily losing ground over the past year. It is still capable of inflicting terror on citizens outside their controlled areas, however, which was proven again by an attack on a hospital on Monday that killed nine, according to Reuters. In July, one of the deadliest attacks in post-invasion Iraqi history took place nearby, in which 324 lives were lost.